Touristic couple taking selfie on Machu Picchu. Machu Picchu on the background. Tourists on Machu Picchu. Couple walking in the ruin of old city. 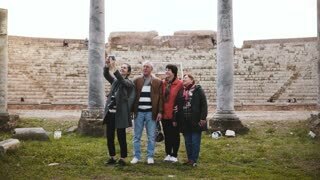 Beautiful couple taking a selfie. 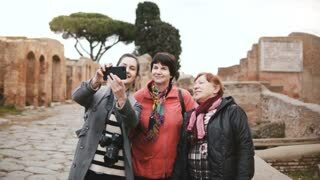 Smiling young European girl and happy senior tourist group taking selfie near old amphitheater ruins in Ostia, Italy. 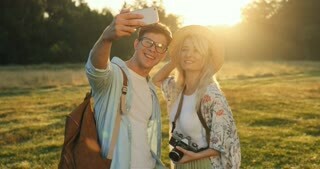 Caucasian cheerful young couple taking nice selfie photos on the smartphone camera while walking as tourists in the field on a summer day.